If you want to understand Bridgewater Associates, the world’s largest and indisputably weirdest hedge fund, you might start with the story of the peas. “Empathy and kindness aren’t a top priority there,” says a former Bridgewater employee. The firm’s culture of absolute candor is designed to strip out emotional considerations and emphasize cold, Vulcan logic in all decision-making—the thin-skinned need not apply. But firm loyalists insist it sounds worse than it is. “Every organization is absolutely riddled with problems,” says one, “but we have a way of fixing them.” Dalio’s Principles, acolytes say, allow the firm’s researchers and traders to sidestep office politics and ego-stroking and focus on what really matters: beating the markets. Which Bridgewater has certainly done. Last year, the firm put up the best numbers in its 36-year history, notching a nearly 45 percent gain in its most aggressive fund on its way to a total haul of more than $15 billion. Those returns—which CNBC ­noted were greater than the 2010 profits of Google, Amazon, Yahoo, and eBay combined—vaulted Bridgewater even further ahead in the hedge-fund rankings and reportedly netted Dalio a personal windfall of more than $3 billion. Post-Madoff, billion-dollar paydays have a way of putting targets on backs, especially amid the insider-­trading scandals now hitting the hedge-fund sector. “They’re just out there in Connecticut, not really part of the scene,” says one Goldman Sachs employee. “But they had a killer year, and with that big a fund …” The Goldmanite trails off. “What do they do? No, seriously. Do you know?” Bridgewater makes it hard to answer that question. Like a lot of hedge funds, it requires its employees to sign nondisclosure agreements designed to keep trading strategies under wraps. Even more than its peers, it cultivates a paranoia in its ranks, monitoring e-mails and phone calls and keeping tabs on employees via a network of overhead cameras. Most of the current and former Bridgewater employees contacted for this article, along with several nonstaffers who were afraid of angering the firm, spoke on the condition of anonymity. But nobody is accusing Dalio of misconduct, and Bridgewater’s reputation among institutional investors is spotless—a recent survey by analytics firm Preqin ranked the firm as the global favorite of public-pension funds. Dalio began his investing career at age 12, when he sunk $300 he’d earned as a golf caddie near his Long Island home into shares of the now-defunct Northeast Airlines. Soon after, the company went through a merger, and its $5 stock price tripled. Dalio’s parents, a jazz musician and a stay-at-home mom, supported his passion for the markets. After college, he took a summer job on the floor of the New York Stock Exchange and eventually became fascinated by commodities futures—derivatives used by Wall Street firms to reduce their exposure to oil, metals, crops, and other resources vulnerable to price swings. It was at the time an unsexy specialty, but in the early seventies, when the Bretton Woods currency crisis sent the stock markets spinning, investors flocked to commodities, and Dalio’s budding expertise was suddenly in demand. Manage as someone designing and operating a machine rather than as someone doing tasks. While his client base was expanding, Dalio began crafting the investing theory that would make him a multi­billionaire. The global economy was a giant machine, he observed, with certain cycles that repeated themselves during economic and political transitions. If you identified those patterns, as well as the smaller events that seemed to trigger them—a LIBOR blip here, a rising debt ratio there—you could build a computerized system that could predict booms and busts. The approach served Bridgewater well: The firm’s flagship fund has lost money in only three years since its founding and boasts an average annualized return of 18 percent since 1991. 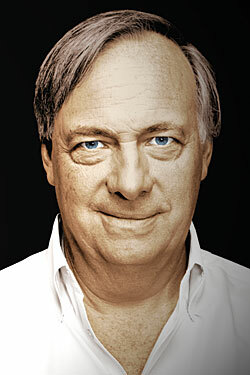 In 2006, Bridgewater’s computers began to indicate that the American economy seemed to be heading for what Dalio calls a “D-process,” a sort of national bankruptcy proceeding in which debt-service payments rise relative to incomes until, under the threat of default, the government is forced to print tons of money and buy up long-term assets. The firm’s traders piled into investments that would be most affected, including, at various times, U.S. Treasury bonds, gold, and the yen. They also studied Japan’s “lost decade” and the Latin American debt crisis of the eighties and used what they learned to program red flags into Bridgewater’s trading system. In the spring of 2008, one of these flags, a risk metric for credit-­default spreads, prompted Bridgewater to pull its entire positions in several banks—including Lehman Brothers and Bear ­Stearns—the week before Bear ­Stearns imploded. In the years since, seeing the crisis coming has become the hedge-fund version of having been at Woodstock, but Dalio and his team actually did it. Throughout 2010, the D-process continued to unfold. By the end of the year, 80 percent of Bridgewater’s bets were in the black, and even critics who’d mocked Dalio’s eccentricities had to acknowledge his brilliance as an investor. The path to Principles began early in Bridgewater’s history, when Dalio began to think that employees, like economies, could be understood as following patterns. Transcendental Meditation informed his belief that a person’s main obstacle to improvement was his own fragile ego; at his firm, he would make constant, unvarnished criticism the norm, until critiques weren’t taken personally and no one held back a good idea for fear of being wrong. Dalio’s chosen investment system depended on such behavior. Unlike at a hedge fund such as Steven Cohen’s SAC Capital, where star traders are given chunks of the firm’s capital to run quasi-independent desks (and offset each other’s losses), everyone at Bridgewater essentially contributes to the same strategy as they work under Dalio and his longtime confidants and co-CIOs Bob Prince and Greg Jensen. Dalio thought radical transparency could optimize the hive mind. “The culture makes you have to listen to other people,” says Giselle Wagner, a former Bridgewater chief operating officer. A corporate gospel isn’t novel—The Bloomberg Way was required reading for Bloomberg News employees years before Dalio set down his ideas. But Principles is no mere training manual. The first half of the book, “My Most Fundamental Principles,” contains Dalio’s abridged autobiography, an apologia for radical transparency, and a step-by-step guide to “personal evolution.” The precepts in this section—many of them written in a digressive, self-serious style that reads as if Ayn Rand and Deepak Chopra had collaborated on a line of fortune cookies—are never about making money, at least not openly. They’re about following rules, learning from mistakes, reaching your goals. Doing things in the Bridgewater way is thought to be the best—and possibly only—way of achieving these objectives. If you live rightly, whatever happens is okay, since, as he wrote, “self-interest and society’s interests are generally symbiotic.” If the hyenas take down a young wildebeest, well, c’est la vie. The document’s second half, “My Management Principles,” contains Dalio’s 277 workplace rules: To hold more productive meetings, “enforce the logic of conversations.” When coaching subordinates, “manage as someone designing and operating a machine rather than as someone doing tasks.” And so on. There is nothing to fear from truth. When a pack of hyenas takes down a young wildebeest, is this good or bad? Ask yourself whether you have earned the right to have an opinion. Bridgewater’s headquarters is a set of three stone-and-glass buildings built around a creek tucked deep in the woods, a few hundred yards past an unmarked turnoff. It’s a low-key setting for a money palace, and the cars in its parking lot reflect a similar ostentatious humility—lots of Civics, fewer Carreras. Dalio’s office sits next to other managers’ on the third floor of the main building. Most hedge funds hire primarily more-experienced investors, but Dalio is said to prefer recent undergrads from schools like Princeton and Dartmouth, who may not know how to price rate swaps but bring other advantages. “Young people are more malleable,” says one employee. “If you take someone who’s led a thousand-person group at a bank and bring them to a place where they can be challenged by their 28-year-old analyst, it’s not going to be easy for them.” Even with those measures in place, Bridgewater life proves just too bizarre for a lot of recruits. Thirty percent of new employees are said to quit or get fired within two years. By hedge-fund standards, Dalio’s lifestyle is almost monastic. He lives with his wife of 35-plus years in a 5,550-square-foot home that’s a flophouse compared to some of their Greenwich neighbors. (Investor kingpin Paul Tudor Jones III has a 13,000-square-foot mansion nearby.) He dresses casually for work in button-downs and rumpled khakis. He bundled money for John McCain’s 2008 presidential campaign but has otherwise expressed no interest in being a power broker. Former employees speak of the charity donations he makes in each staffer’s name during the holidays, and some recalled his practice of lending out his vacation homes. Bridgewater’s institutional clients, most of whom would invest with Gary Busey if it meant a 45 percent return, seem happy to overlook the hoopla surrounding Principles. But according to people who know him, Dalio has been hurt by the suggestions that he’s basically running a mind-control operation. After an article last month in Absolute Return + Alpha magazine lambasted Bridgewater’s culture as “brutal” and “demoralizing,” Dalio made an exceedingly rare TV appearance on CNBC’s Squawk Box. Part of the defense he gave was tactical—Dalio indicated that the hype surrounding Principles had made hiring more difficult. But it also seems that Dalio might now be coming around to the idea that not all battles are worth fighting, after all. Last month, a slightly tweaked version of Principles appeared on Bridgewater’s website. The document’s revised title: Principles (That Might Be Right or Wrong, for You to Take or Leave).